A contradictory interplay between fame and anonymity has come to define the early-21st century, where every Twitter handle allows a peer-to-peer exchange in the servers of cyberspace, while actual flesh and blood people remain cloistered behind their devices. Even as technology creeps further and further into our lives (your phone was the last thing you looked at before going to bed last night, and it was likely the first thing you reached for the moment you woke up this morning), there remains a fundamental distance between individuals. All it takes is turning the phone off, and suddenly you’re a balloon unfettered, blowing away in the wind. 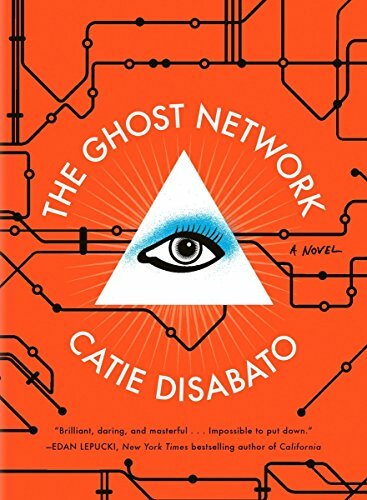 In a sense, that’s the choice the protagonist of Catie Disabato’s debut novel, The Ghost Network, makes. Enigmatic pop star Molly Metropolis, a biracial Lady Gaga type, has risen to fame on a wave of unlikely EDM hits. While her music garners fans, her true allure stems from a mysterious persona in constant conflict between transparency and secrecy. She walls herself off behind a hedge of intimates while simultaneously stoking a direct relationship with her fans through social media and the regular channels of celebrity. At the peak of her fame, Molly chooses to disappear, setting off a series of quests to uncover the truth behind her sudden departure. Disabato suggests, however, that retreating into anonymity may not actually be possible. A book about our conflicted relationship with anonymity is particularly apt at this moment in American history. Technology has ushered in an era of connectivity unimaginable until recent years. Never have we been more interconnected with our communities, families, and government. The benefits are legion. Loved ones are never out of reach. After a night of drinking, Uber is never more than a few minutes away. And virtually every quanta of human knowledge is readily accessible by every citizen for free thanks to Google and its ilk. That tremendous power, of course, comes at a price: a deep and constant surveillance. Disabato’s book features a large, open eye on the cover. The image sums up the novel’s feel, while also perfectly capturing the imbalance of power in our post-Edward Snowden democracy. Surveillance in 21st century America goes only one way — from the top down. Forget terms like “the digital age;” a better descriptor would be “the panopticon age.” A panopticon specifically refers to a prison designed so that all inmates are potentially visible by a central, unseen jailor. It’s an old design, and one that is notoriously psychologically violent to the imprisoned. By creating the possibility of complete scrutiny, a prisoner’s willingness to deviate from sanctioned actions atrophies. The rule of law may endure, but often it comes at the expense of the imprisoned subject’s sanity. Few of us inhabit physical panopticons, but our increasingly digital lives allow for the same kind of comprehensive observation. Molly Metropolis’s disappearance and the subsequent manhunt bring up some uncomfortable questions when examined through this filter of surveillance, chiefly: When does a citizen’s ability to opt-out cease? Disabato suggests the city provides some relief in the form of anonymity. Another pop star, John Lennon liked New York precisely because he could disappear into the urban fabric. Pop stars make good proxies for a surveilled populace because they live largely public lives, a state that, until recent history, was barred to most people. Of course, nowadays, we all live that way, or potentially do. Any city is a cipher; its vast and often conflicting history is a tapestry of human ambition, a receptacle for realized and unrealized potential. The eponymous “Ghost Network” of Disabato’s book is a massive multimedia art piece attempting to reify some of that potential by synthesizing every Chicago transit line, real or proposed, or built and lost, into a living document. Designed and executed by Molly and a cohort of intimates, the project is an extension of Molly’s obsession with Guy Debord and the Situationist International, a mid-20th-century avant-garde and anti-authoritarian revolutionary group committed to critiquing what they saw as the “spectacle” of a modern life mediated by objects. Part map, part wiki page, the “Ghost Network” is a breathtakingly beautiful and, ultimately, foolhardy endeavor. As Rebecca Solnit points out in the introduction to her atlas, Infinite City, all maps have structural limitations, writing: “A map is in its essence and intent an arbitrary selection of information.” Solnit’s atlas is a palimpsest of another city, San Francisco, but the underlying principles apply broadly. Reading such a text may provide pleasure by satisfying historical curiosities, but it can never fully explain its subject. The structural limitations are simply insurmountable. Yet Disabato’s hybrid map hints at a utopian vision for the city’s potential to be a place where one can simultaneously take advantage of the benefits of technology without ceding the right to privacy. There’s an unmappable critical mass of humanity in cities, and, if all else fails, she suggests, you can always cut the connection and disappear into urban anonymity. One of Molly’s intimates, Nick Berliner, does just that when he embarks on long, aimless walks through Chicago. For Berliner, it’s a pseudo-revolutionary act rooted in Situationist principles of disruption. The walking, Disabato writes, “chang[ed] course based on feeling rather than on traffic signals, breaking the boundaries implicit in the inflexible confines of roadways, sidewalks, and other route designators.” The city, then, is a confrontational space, too, one that, paradoxically, provides for the possibility of security by violating the very boundaries meant to safeguard a modern life. But, as history shows, John Lennon wasn’t always safe in his metropolis. Why should we expect security in ours? None of us, it seems, can resist the temptation to take advantage of our technology, despite knowing the terrifying extent to which our quotidian existence is surveilled. (I’m writing this in Google Drive, which means the first reader will be the NSA.) Just as Solnit’s atlas practices a selective amnesia when mapping certain elements while ignoring others, so, too, do we delight in the ubiquity of personal correspondences, while choosing not to acknowledge the watchful eye of surveillance. Disabato seems to suggest that, in fact, we are compelled by our inquisitive nature to erode privacy. Whatever statement Molly Metropolis desires to make with her disappearance is undercut by her work on the “Ghost Network.” For what is a chimerical map of the realized and proposed Chicago transit system — the very means of human movement through an urban landscape — but an offering to our fundamental desire to know everything, including the ways we navigate our environment, or, to employ the parlance of the NSA, the “metadata” of our quotidian existence? The danger isn’t knowledge, but rather the loss of privacy; a panopticon is damaging precisely because constant observation erodes a subject’s will to resist. Without privacy, we become conformists, our own jailers. To have the knowledge while retaining privacy represents the utopian drive at the center of this book and the conflict ensnaring its protagonist, a pop star enamored of a philosophy diametrically opposed to celebrity. If Disabato aspires to the impossible, she’s not alone on that path. Marisha Pessl’s Night Film has similar ambitions, employing its own mixed-media approach to generate its animating enigma. In Night Film, a disgraced journalist goes to great pains to investigate the mysterious death of a reclusive director’s daughter. While they approach on different tacks — Disabato’s is a pop star and Pessl’s an auteur in the horror genre — both novelists are sailing towards the same mark. Examining celebrity, they are writing toward a critique of the technological panopticon, while simultaneously enthralled by its ability to, among other things, generate interest in those very books. A recent promotion by Disabato’s publisher, Melville House, encouraged readers to use social media to locate free copies of her book deposited around New York City. Similarly, an app for Night Film allows readers of that book to “decode” hidden content in the text. Both approaches are clever plays by savvy publishers and authors to exploit their novels’ content in a way that complements the digital lifestyles of readers, but they strike me also as an insidious creep of surveillance into one of the few spheres of disconnected living remaining in our modern world. As a reader, there’s nothing forcing you to scan the text, but who among us can resist a literary Easter egg (or a free book)? On it’s own there’s nothing wrong with an app that enriches a reading experience anymore than there’s something wrong with possessing an archive in the form of text message histories of every funny message, photo, or GIF you’ve ever received from your spouse. These things undoubtedly enrich our lives, but there’s another side to that as well. Disabato and Pessl understand that. Taken together, our apps, text messages, travel records, etc. constitute the web of surveillance we’re spinning for ourselves everyday. They are our own personal atlases, our own “Ghost Networks,” except unbound by the necessary selectiveness of traditional maps, and they are open for examination (and exploitation) by anybody with the right technology and motivation. Somebody is watching everybody in this book. Molly Metropolis’s obsession with Situationist philosophy and her subsequent disappearance are just too-rich catnip for some of the novel’s other central figures to pass up, so we get a meta-narrative with shades of a detective novel. The focus of all this inquisitiveness happens to be Molly, but it could be any one of us, really. The enigmatic pop chanteuse makes an excellent proxy for government surveillance of ordinary citizens; we’re all the celebrities of our own lives, after all. The “Ghost Network” and other artifacts left behind also hint at a third act, post-panopticon utopia hidden in the real world, one that requires a certain level of technological acumen to access but which remains obscured from surveillance — the physical analog to an anonymous manifesto. The very structure of Disabato’s book undercuts the point, however. At least to some extent, Molly is traceable even after she’s opted out. In effect, she’s hoisted up by her own petard. It’s not just Molly Metropolis who leaves behind a traceable digital footprint. We all do, and those footprints remain whether or not we disconnect. In the end, we are all in the panopticon. The question then becomes not if surveillance is avoidable but, rather, is anybody looking? Dan Lopez lives in San Francisco. His work has appeared in The Collagist, Storychord, Mary Literary, Time Out New York, and others. His collection, Part the Hawser, Limn the Sea, is a finalist for the Lambda Literary award for LGBT Debut Fiction. You can follow him on Twitter and on Instagram. Check out his website at danlopezauthor.com. Malcolm’s excellent title piece is a good choice to open this collection. Forty-one numbered sections give forty-one different beginnings to a profile of the painter David Salle, written in 1994. It’s amusing to wonder if Malcolm initially meant to write a more traditional profile, and fell into this arrangement through difficulties, or if she always planned this format, for it nicely mimics Salle’s collage approach. Just as Salle’s canvases in which he allows nothing to be original – he works only with previously produced images from magazines, photo files, and art history – transform their individual elements into a new whole, a complex and many-faceted portrait emerges from Malcolm’s fragments. It’s a portrait not only of Salle himself, his aims and his methods, but of a particular generation of artists who came of age in the 1980s and generated tremendous hostility with their jettisoning of high-modernist pieties. This is a beguiling argument, expressed as vividly as Malcolm expresses anything, but I don’t buy it. The objective “I” (or eye) is a boon and not a drawback for the autobiographer. Without it we get solipsism. In one essay here, Malcolm is quite critical of a memoir by Angela Garnett, the daughter of Virginia Woolf’s sister Vanessa Bell. Garnett grew up amid the various eccentricities and bohemianisms of Bloomsbury, and did not learn until she was eighteen that Bell’s husband was not in fact her father. While Malcolm sees Garnett’s sour view of her mother and the Bloomsbury circle as something that “cannot be pushed aside,” she also finds Garnett’s memoir “unpleasant” and narrow-minded. She suggests strongly that Garnett lacks the ability to get outside of her own skin, to see the world of her youth with sufficient detachment. In Malcolm’s case, imperfect objectivity is a selling point — one of her most appealing qualities as a journalist is that she is always present, both explicitly and implicitly, on the page. Her judgements are evident, and so is her process of thought. “What are the properties and qualities of authentic art, as opposed to ersatz art?” she asks herself, and us, in “Forty-One False Starts.” David Salle is “an acutely intelligent, reserved, and depressed man,” she tells us in the same essay. In an essay on Edith Wharton: “There are no bad men in Wharton’s fiction.” Malcolm suggests that Julia Margaret Cameron’s often scoffed-at 19th-century photos of children and housemaids dressed up to illustrate Biblical tableaux are works of merit, and remarks that someone should have dissuaded Irving Penn from mounting an exhibit of (to her, unsuccessful) photographs at the Whitney in 1999. It is this gentlewomanly but insistent presence that makes Malcolm both instructive and entertaining to read. One never senses that her judgments are gratuitous or off the cuff: she comes off as the most careful of writers, one who takes her time, who rethinks and revises constantly (in the short eulogy “William Shawn,” she singles out her famous New Yorker editor for teaching her that “the slowing down was the important thing”). She may not always convince – her piece on Edith Wharton’s supposed misogyny struck me as quite off-base – but her opinions are always worth considering. She has a particular style of scene-setting that more than anything marks a work of hers as “a Janet Malcolm piece”; for instance, she likes to take a subject’s living space and make it speak for that subject. So Salle’s loft is “sleek, cold, expensive, unused,” while that of formidable critic Rosalind Krauss has “a dark, forceful, willful character. . . . No one can leave this loft without feeling a little rebuked.” Ingrid Sischy’s method of chopping tomatoes comes to speak for her inefficient but tenacious and ultimately successful captaining of her influential publication. Besides the Salle and Sischy articles, the strongest pieces in Forty-One False Starts are on photographers: Edward Weston, Diane Arbus, Julia Margaret Cameron, and Thomas Struth, who was recently commissioned to do Queen Elizabeth II and Prince Philip’s official portrait. In these diverse essays, a connecting thread is the sense of embattlement and defeat many artists suffer from, their constant struggle to create something that answers to their deepest intuitions of truth or beauty. Malcolm puts it most powerfully in a comment about writers, invoking their endless fight against “the pretentiousness, intellectual shallowness, moral murkiness, and aesthetic limpness that come naturally to the pen.” Then there is the chronic feeling among artists, not paranoid but quite realistic, of being under-appreciated and misunderstood. The confident, ecstatic engagement – or “flow,” to put it in pop-psych terms – that non-artists think of as an everyday part of the artist’s life is very little in evidence here. Making things is hard work, sometimes exhausting, often leading to failure. Janet Malcolm explores the artist’s temperament as a source that feeds and is adjunct to the making process, rather than as something of separate and greater meaning. Thank goodness. My only significant complaint about Forty-One False Starts is that so few entries in it are recent – meaning that Malcolm, who has produced excellent journalism in other areas in recent years, is not doing enough new writing on art to satisfy her hungry readers. It’s hard to love the sport without being, also, deeply aware of what a bestial exhibition it is. It’s uncivilized, dirty, corrupt, and ought to be against the law. It’s a racket that refuses to be rehabilitated, and a volatile, exhilarating vice. It’s not the large problems that drive The Arrivals but the small ones—Mitchell’s meticulous attention to detail and the vibrancy with which she portrays the complex emotions of family life. This is not a book about there. It’s about here, what America feels like, here, and now, while at war.